Escape the Crowds. Stay Aerial. Ah summer, the time of travel, family vacations, and endless outdoor adventures. The only issue- EVERYONE is doing the same thing. Nearly every national park, state park, popping city, and not so hidden paradises are being overrun by the crowds. You spend half your day looking for parking and the other half peering around the people trying to take in the spectacular views everyone talks about. At this point, you’re probably asking where you can escape and still have an incredible summer adventure. Why not escape into the trees? Ziplining near national parks is the perfect opportunity to take in the beautiful scenic views, smell the fresh air, and stay above the crowds. Check out these ziplining adventures located close to national parks in the northwestern United States! Don’t miss your chance to zipline Glacier National Park, Crater Lake, or Sleeping Giant in Yellowstone. Are you traveling to Glacier National Park this summer and looking for things to do in addition to hiking in the park and driving Going-to-the-Sun Road? Book Glacier Highline’s Park N’ Paddle Package and get the best of Glacier’s activities. Hit the ziplines and aerial adventure park in the morning and then jump into the whitewater with Glacier Raft Co on the middle fork of the Flathead! Great for families, couples, or individuals just looking to get out and explore the park. There’s rumors the notorious yeti has been spotted in Montana recently, very close to Glacier Park actually, and Glacier Ziplines is claiming to be friends with the yeti. Besides just seeing the yeti, the zipline track at Glacier Ziplines offers spectacular views of the Flathead River, Great Northern Railway, and Badrock Canyon. Is one of your life goals to see all the “firsts” in the world? Well here’s a first you don’t want to pass by. You can fly over the nation’s first forest – the Shoshone National Forest- with Sleeping Giant Zipline. Located just a few miles away from the East gate of Yellowstone National Park, this national park zipline takes you through spectacular views of the area. Planning family vacations is no easy task. There’s always disagreements on what activities to do and where to go. Yellowstone Park Ziplines keeps families together and makes sure no one leaves disappointed. They offer a zipline and rafting package, as well as a zipline and horseback riding package. You’ll get the best of both adventures for the whole family! The closest you can get to ziplining in the Tetons is right in the middle of Jackson Hole, Wyoming. You’ll barely need to step outside your door to jump on the zipline. 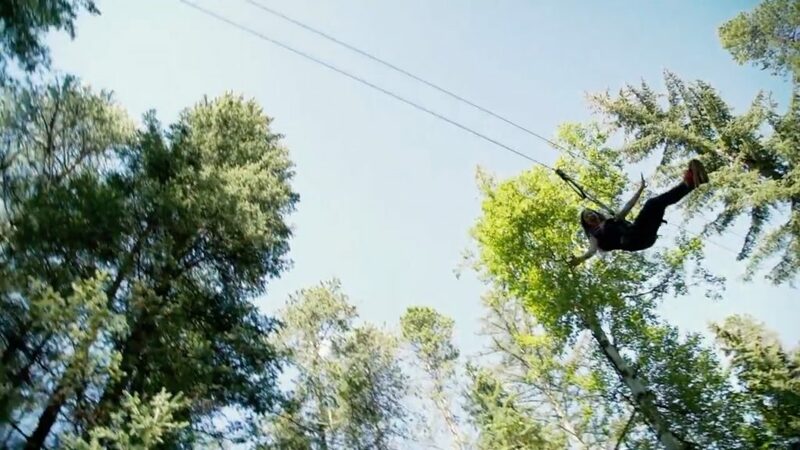 Snow King Mountain Resort offers a treetop adventure suited for both children and adults. You’ll get glimpses of the Tetons, the National Elk Refuge, and the breathtaking valley as you whiz by on the zipline. How good is your aim when you’re traveling 40 mph? Confidence is key they say at Yosemite Ziplines and Adventure Ranch. When you get to line 5 in the zipline course you’ll be given a beanbag to toss into a target. Now we’re no physicists or mathematicians, but if you drop it right as you’re over the target you’ll hit the bull’s eye. As you zipline through Bryce Canyon you’ll get views of the Grand Canyon North Rim and the Grand Staircase-Escalante National Monument. Take in some of the greatest scenery in the desert southwest and soak up some Vitamin D.
If you’re into jaw-dropping views and exhilarating adventures then don’t hesitate to jump on this national park zipline. The surrounding cascades plus Upper Klamath Lake make ziplining this national park an incredible experience. Crater Lake Ziplines has the longest ziplines in Oregon and the only zipline canopy tour on a National Forest. This needs to be on your ziplining bucket list. Mount Hood is one of the most popular glaciers in the north-west, offering year-round adventures. During the summer you can ski in the morning and zipline in the afternoon! Skamania Lodge is the go-to-place for ziplining near Mount Hood. Zip Wild features aerial runways through the dense forests of Northwest Trek. The zipline course is the perfect length to work into a day full of exploring Mount Rainier National Park. Whether you’re a local or a traveler, ziplining near national parks is an adventure activity that can’t be beaten. If you find yourself making the trek to the last frontier and you’re looking for a thrill in the Denali National Park area, then you can’t miss out on Denali Park Zipline. You’ll soar over the Boreal Forest and the tundra. A must do national park zipline! Whether you’re a first-timer or a seasoned zipliner, we hope you continue to explore the ziplines near national parks. Get off the beaten paths and explore new heights in the areas you travel to. And if you’re a zipline enthusiast like us, then we challenge you to zipline all 50 states! For those in Montana that are just starting, Glacier Highline is a great introduction to the ziplining world and your aerial adventures!